The significant increase in the prevalence of oral diseases is having a considerable impact on the demand for dental equipment, among which dental chair is an important one. The global market for dental chair is also propelled by the infrastructural advancements in the medical and healthcare industry across the world. Going forward, the market is expected to gain substantially from the technological advancements in the years to come. According to Transparency Market Research (TMR), by the end of 2017, the worldwide market for dental chairs is expected to reach US$455.5 mn. Further, the opportunity in this market is projected to rise at a CAGR of 3.90% over the period from 2017 to 2022 and increase to US$551.8 mn by the end of the forecast period. The increasing awareness among people about overall oral health and hygiene is also expected to drive the growth of this market over the next few years. In terms of the geography, the global market for dental chairs is broadly categorized into the Middle East and Africa (MEA), Asia Pacific excluding Japan (APEJ), North America, Europe, and Japan. Among these, Europe has surfaced as the leading regional market for dental chairs. Creating an absolute opportunity of US$27.9 mn during the period from 2017 to 2022, this regional market is anticipated to remain on the top over the next few years. The increasing patient pool suffering from teeth related disorders is expected to boost the Europe market for dental chair in the near future. This regional market is also expected to gain from the rising number of laboratories. North America, which is at the second position currently, will also manage to retain its position over the forthcoming years, thanks to the presence of advanced medical and healthcare infrastructure and a large number of established supplier of dental chairs in this region. Amongst other regional markets for dental health, Asia Pacific excluding Japan is anticipated to report a significant rise over the next few years. 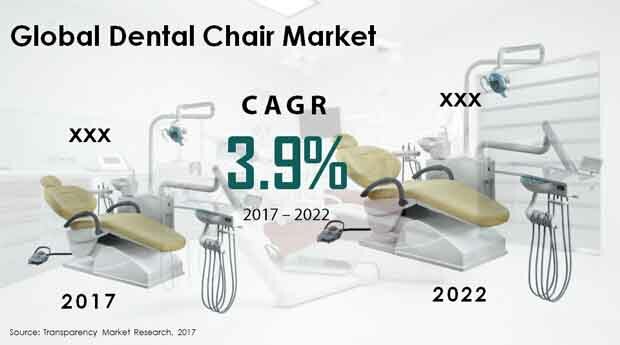 The growing awareness among consumers about oral health and the steady upgradation in healthcare infrastructure is projected to propel the APEJ market for dental chair in the years to come. Examination chairs, oral surgery chairs, orthodontic chairs, and portable chairs are the main types of dental chairs available across the world. Among these, the demand for oral surgery dental chairs is relatively higher, currently, and is anticipated to remain so over the next few years. However, the demand for other types of dental chairs is also increasing steadily, worldwide. On the basis of source, dental chairs are of two types: Powered dental chair and manual dental chair. Hitherto, the manual dental chairs have been dominating the global market. However, the manual dental chair segment has also gained momentum and is expected to surpass the former in the years to come. Hospitals, Clinics, and ambulatory surgical centers (ASCs) have emerged as the key end users of dental chairs, globally. The demand for these chairs is much higher in hospitals and clinics than ASCs and the trend is expected to continue over the forthcoming years. The worldwide market for dental chair demonstrates a highly competitive business landscape. Danaher, A dec Inc., DentalEZ Inc., Dexta Corp., Dome Inc., Midmark Corp., Planmeca Oy, Dentsply Sirona Inc., Technodent, and Forest Dental are some of the leading dental chair suppliers across the world.